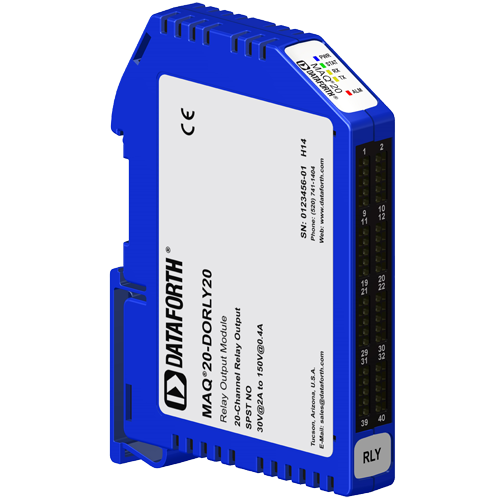 Dataforth Corporation has added a Discrete Relay Output Module to the powerful MAQ20 system, significantly increasing system capabilities and flexibility for a wide range of industrial applications. The new MAQ20-DORLY20 module offers 20 isolated SPST latching relay output channels that can switch between 2A at 30V and 0.4A at 150V. Each channel has contact state readback to verify the physical output state. Relays can be controlled individually or in blocks and have user configurable default output states which are set upon power up, power loss, and module reset to ensure failsafe operation. Other features include advanced output functions, user defined logic polarity, and fast switching times. Field output connections are made through high density spring cage terminal blocks. Reserve power is stored and used for predictable shutdown to user-defined relay states upon loss of module power. Output-to-bus isolation is a robust 1500Vrms and each individual channel is protected up to 150Vrms continuous overload in case of inadvertent wiring errors. 150Vrms channel-to-channel isolation gives the module the ability to control equipment with or without common signal grounds or different pieces of equipment with multiple reference potentials. Like all MAQ20 modules, the MAQ20-DORLY20 is designed for installation in Class I, Division 2 hazardous locations and has a high level of immunity to environmental noise commonly present in heavy industrial environments. Find the details on the new MAQ20-DORLY20 as well as updated data on all MAQ20 system modules in the latest MAQ20 Product Catalog. The MAQ20 system incorporates more than 30 years of design excellence and quality in the process control industry. It was developed for factory, process, and machine automation; military and aerospace, power and energy, oil and gas, and environmental monitoring applications, and also is ideal for use in many test and measurement applications. Dataforth products directly connect to most industrial sensors and protect valuable measurement and control signals and equipment from the dangerous and degrading effects of noise, transient power surges, and other hazards present in industrial environments. Dataforth products are manufactured in the USA and are RoHS II compliant. The company operates under an ISO9001:2015 registered and certified Quality Management System. For additional information, call 800-444-7644 toll-free, email sales@dataforth.com, or visit our website at www.dataforth.com.